Momentum Pro is an efficient solution for small to mid-sized printers that are looking for a dependable RIP combined with the ability to control and preview jobs from other desktops on the network. PDF Tools including integrated PDF creation and preflight add powerful PDF capabilities. Momentum Pro is an integrated automated workflow solution that consists of the Momentum RIP and Momentum Workflow. The foundation of Momentum Pro is the Harlequin-based Momentum RIP which has long been recognized as one of the premiere RIPs in the industry. The Momentum Workflow adds a graphical user interface to the Momentum RIP giving pre-press operators RIP control directly from their desktop. Workflows can be tailored to meet the requirements of specific jobs or customers to further streamline the process. 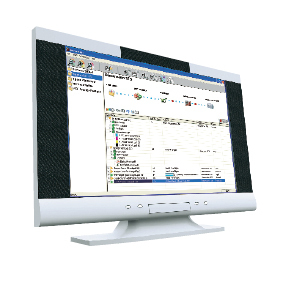 Clients enable pre-press operators to remotely view and manage the workflow from a Mac or PC workstation. This helps reduce unnecessary trips to the RIP workstation by bringing control directly to the operator. The system includes 2 clients with the option of adding up to a maximum of 10. Momentum Pro has the capability of managing 2 different Momentum RIP’s simultaneously. This increases throughput and streamlines the production process. The system includes support for 1 RIP with the option of adding up to a maximum of 3. TrapPro is an object-and vector-based in-RIP trapping program. The main features include auto-chokes super blacks, small text protection, raster-to-raster trapping, sliding traps, mitered ends and feathered traps. Momentum supports a wide variety of proofing options, including the most popular ink jet proofers from Epson. Adding a proofing plug-in to Momentum closes the color loop, ensuring data integrity. The same RIP is used for proofing and final output to plates. Momentum Pro’s FM screening is based on Harlequin’s HDS (Harlequin Dispersed Screening). This screening technology is a perfect fit for Presstek 34DI and 52DI presses. HDS creates images with increased sharpness with a continuous tone appearance. The CIP3 output plug-in enables Momentum to produce Print Production Format (PPF) files containing information about print jobs, including administrative data, information about inks, and preview images.